Whether you're a tournament, trophy or recreational angler, now is the time to hit your favorite hole or try out a new body of water. Big bass are on the move, positioning themselves for the approaching spawn. The month of March offers the best opportunity to catch a lake- or state-record largemouth. 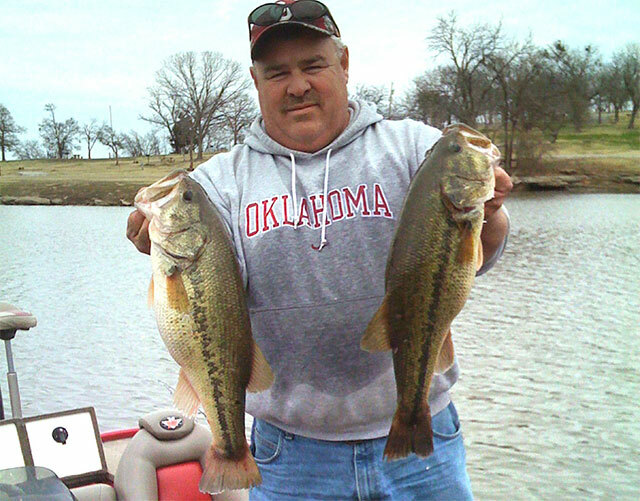 Fifteen of the top 20 heaviest largemouth bass recorded in Oklahoma history have been caught in March. Three of the remaining five spots were landed in the last two days of February. It's no coincidence record bass are caught mostly in March. "Fat reserves in female bass are the highest they will be for the year," said Cliff Sager Fisheries senior biologist for the Oklahoma Department of Wildlife Conservation. "As water temperatures begin to rise into the mid-50s, these fish will gorge on available food sources to ripen their eggs in preparation for the spawning season." This offers Oklahoma anglers a window of opportunity to land a true giant, an opportunity made possible by the Wildlife Department's Florida bass program. Sager, who coordinates the stocking distribution, and Ike McKay, who oversees production of the bass, operate out of the Durant Hatchery, in south-central Oklahoma. Florida bass are genetically programmed to grow to larger sizes than the typical northern largemouth native to Oklahoma waters. The Department started the Florida bass program in the early 1970s. "We stock around 1 million Florida bass fingerlings across the state each year," Durant Hatchery manager Gordon Schomer said. Since the program's inception, the largemouth bass state record has been broken 10 times, including two of the past three years. Your best chance to hook one of these large fish is on days preceding or following a cold front. The next 10 days will provide Oklahoma anglers the best opportunity to land a big largemouth and possibly a new state record. Some lakes, by region, to find large bass are Lake of the Arbuckles, McGee Creek and Murray in south-central; Broken Bow, Cedar and Sardis in the southeast; Watonga in the northwest, Lawtonka in the southwest; Sooner in the north-central; Tenkiller in the east-central; and Eucha and Grand in the northeast. "Eucha produces a lot of 7- to 8-pound-plus largemouth, especially in early spring," said Josh Johnston Northeast Region Fisheries supervisor. "Grand is arguably the best bass lake in the Midwest, and Tenkiller is home to some very healthy smallmouth bass. It is fairly common in February and March for a tournament on Tenkiller to be won with a five-fish stringer of smallmouth in the 25-pound range." It is important to remember at this time of year that a bass' metabolism has slowed to conserve energy and weight. Typically, large bass will not exert more calories than it intakes, so large baits, fished slowly, will provide the best chance to hook a big fish. "A big bass would rather ambush one large shad and digest that meal for the rest of the day than chase around small prey, so that's something to keep in mind when fishing at this time of year," Sager said. If you land a fish you believe to be a lake or state record contact a Wildlife Department Fisheries Division employee or game warden in your region. See below for a list of Fisheries regional contacts. To find the game warden in your county, go to wildlifedepartment.com/laws_regs/lawstatemap.htm.